My first session on the puppetry foundation course was absolutely fascinating and made me appreciate what a real art form puppetry is! We looked at why and how puppetry works and were introduced to the idea of puppetry as a communication medium. We examined how the performer treats the object/puppet and how that effects the way the audience perceives it. 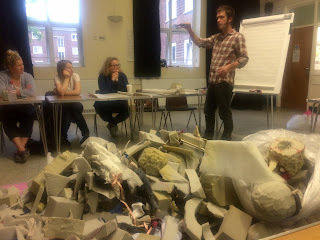 Oliver Smart (the course tutor) emptied a big bag of puppets onto a table and demonstrated a whole range of them. It was so skilled and entertaining! The strange thing was that the performer completely disappeared and even though you knew they were still there and you could clearly see them operating the puppet, you switched them off. The puppets became more real and life-like than the performer!